Upon arrival in Tashkent airport you are met and transferred to your hotel. Morning spend at your leisure. To visit the old town: we start by visiting the 12th century Masusoleum of Kaffal-Shashi , theIslamic scholar, poet and mystic who was born in Shash region (Tashkent today). His tomb with its 12 meters high entrance decorated with beautiful lattice and a quotation from Koran is a popular place of pilgrimage for Muslims. Next visit the 16th century Barak Khan Madrassah, with medieval Islamic architectural. Tilla Sheih Mosque, the former main mosque in Uzbekistan was built in 1856-57 and Chorsu ( 4 ways)Bazaar located on the Silk route for many centuries, have been one of the busiest bazaars in Central Asia. Visit 19th century Abdul Kassim Medrassah – famous for his ability to recite Koran by heart. Now is center of traditional craftsmen using hujra (small room) as workshop for metal carving, wood carving, silk paper painting, and ceramics, artists will be presenting their own work. Visit Museum of Applied Arts, with impressive traditional architectural exhibits objects from ancient until recent times such as glass, porcelain, ceramic, carpet, miniatures and jewellery. Visit Mustakillik Maydoni (Independence Square) the largest city square in the former Soviet Union in the heart of Tashkent, then we visit famous Tashkent Metro (underground) beautifully decorated with local marble and granite with hanging Chandelier which Uzbek are proud of and call it underground palace. After breakfast drive to Samarkand, the second-largest city in Uzbekistan and UNESCO world heritage. On arrival check in your hotel. Afternoon half day city tour of Samarkand to visit: Registan Square with its three beautiful Madrassahs (Islamic center for scholarly study), the Ulugh Beg Madrasah (1417–1420), the Tilya-Kori Madrasah (1646–1660) and the Sher-Dor Madrasah (1619–1636). 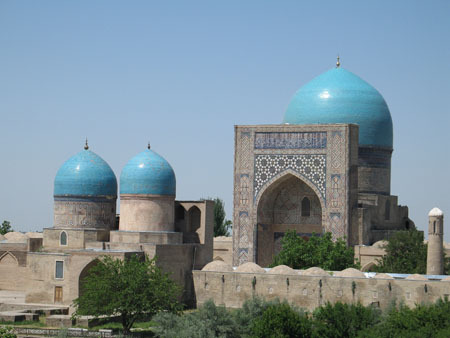 Visit Gur Emir – the mausoleum of the Great 14th century ruler Tamerlane. Afternoon visit Afrosiab museum, the Museum of history of Samarkand Named after the legendary king of Turan, Afrasiab and Ulugh Bek’s observatory once was center of astronomical study built in the 1420s by the Timurid astronomer Ulugh Beg. Morning drive to Bukhara en route excursion to Shakhrisabz – This ancient city is the birthplace of the Great Amir Temur. 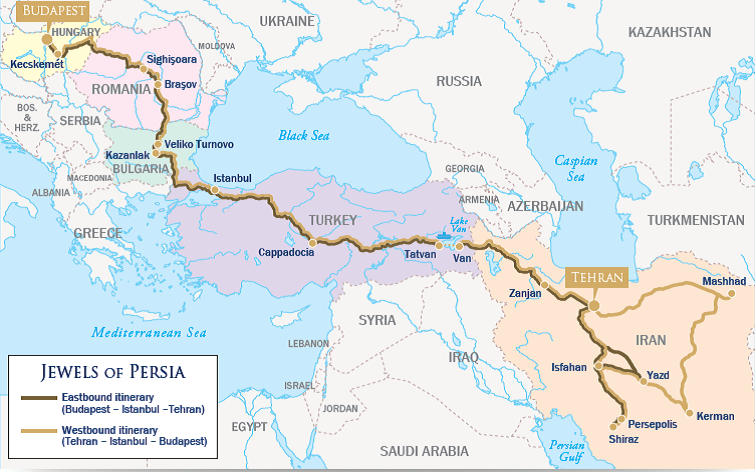 Alexander the Great met his wife Roxanna in the area in 328-327 BC. Visit Ak Saroy Palace ruins, Timur summer palace. Tilavat seminary, the memorial complexwas first constructed in 13th by Islamic scholar Shams ud-Din Kulal, one of his follower was Turghai Amir Timur’s father who studies in this madarassah so did his son Timur. Kok Gumbaz mosque, the largest Friday mosque in Shakhrisabz built 1435-1436crowned by a huge dome covered with blue ceramic tiles which gave the name to the mosque Kok Gumbaz that means “Blue Dome’. The mausoleum of Dorus Saidat, built by Timur to house the tomb of his favourite son Jehangir who was killed in 1375, the Friday mosquewith a large brick domebuild 1904. Visit – Lab-i-khauz, a pool fed directly from the city’s canal, the characteristic of Bukhara and the best survivor on its own kind almost unchanged since 17th century when it was built. The pool is centerpiece of a magnificent architectural ensemble, shaded by ancient mulberry trees. Lyabi- Magaki Attari mosque: the oldest mosque in central Asia with interesting history. The remains of heathen shrines, Zoroastrian temple, Buddhist temple has been found on this site. Kalon minaret is one of the defining symbols of Bukhara. Towering over the city over 48 meters high, this javelin thrust into heart of the oasis town has dominated to Bukhara skyline for over eight and a half centuries, the initial augur to exhausted caravans that they had, at last arrived at a truly great city. The minaret was tallest free-standing tower in the world at that time which was built to provide the call to prayer. Poi Kalon mosque, one of the most ancient mosque in central Asia it is also the second biggest with a stadium like open air capacity of 10-12000 people. The original mosque build in 795 and the present structure was finished 1541. We visit the 17th century Madrassah Abdul Aziz Khan with its stunning interior decoration and courtyard. Visit 15th century Ulug bek Madrassah commissioned by Timurid ruler Ulug Bek , its star motifs reflect Ulug’s fascination with astronomy. The 17th century Bolo-Hauz Mosque was a place of prayer for the Emirs and their entourage with elegant wooden pillars, carved and painted decoration, multi-column Iwan, domed mosque, minaret and a pool. Chashma Ayub (spring of Job). Job came to Zerafshan valley and witnessed a terrible drought he struck the dusty earth and a spring water appeared at this spot. Morning half day excursion to Sitora-i-Mokhikhosa, The summer residence of the former emir of Bukhara with unique mixture of traditional Russian architecture harmoniously mixed with the local oriental traditions. In the afternoon excursion to Bahauddin Naqshbandi Mausoleum, the rest place of famous 14th century spiritual Sufi leader. Return to Bukhara and enjoy walking among streets of the old town. Meet your guide at Farab border. Complete border formalities. Drive to Turkmenabat for lunch. After lunch drive to Mary. On arrival in Mary, transfer to Margush or Yrsgal hotel 3* (subject to availability). After breakfast at hotel transfer to Turkmenistan-Iran border at Bajigiran (45 km). Complete border formalities. Meet your guide at Turkmenistan-Iran border. Drive to Mashad. (3-4hours).Time permit visit Imam Reza shrine at night. 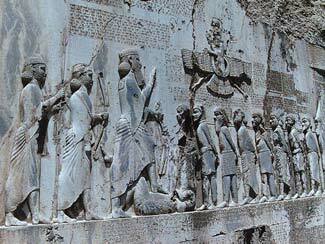 Excursion, to Persepolis, “Ancient Capital of the Achaemenian Kings” established by Darius I in the late 6th century BC. it is known today in Iran as Takht-e Jamshid (“Throne of Jamshid”) after a legendary king. The Greeks called it Persepolis. Drive to Yazd (425km 6-7 hours). Visit the tomb of the Cyrus the great in Pasargade on the way. 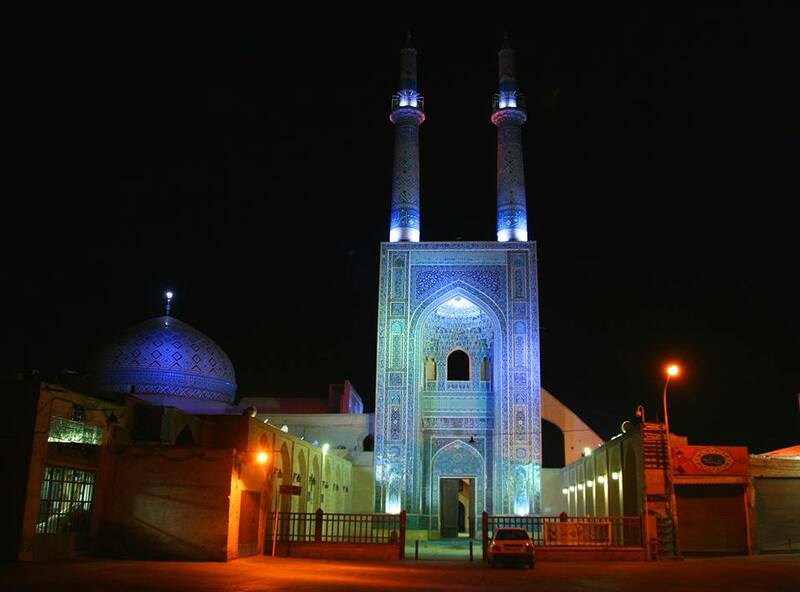 According to UNESCO Yazd is the Second Historic City in the World. We visit the Towers of Silence, (Zoroastrian’s commentary) – where the dead were left to be picked clean by the vultures. the Friday Mosque, dates back to the 14th century and is one of the most beautiful tourist attractions in the central Iran, the Zoroastrian Fire Temple, the fire has supposedly been burning since 470 AD. Amir Chakhmagh mosque, one of the most valuable artistic historical heritages and treasures of the Islamic-national architecture Day sightseeing in Yazd. Visit the two Zoroastrian Towers of Silence (Dakhma), and Fire Temple, the Islamic sites of the Friday Mosque and the Mirchachmagh Maidan and Mosque. Explore the old Fahadan area of Yazd. Sightseeing in this fascinating city continues with the Friday Mosque, a treasure architecture, Chehel Sotoun, which was built as a reception hall by Shah Abbas II in 1647 Hasht Behesht Palace with fine murals and spectacular roofs, Khajou Bridge ,built by Shah Abbas II in 1650, it is 123 metres long with 24 arches. We drive to Abyaneh then Kashan (264km 2-3 hours) located on the rim of the central Salt Desert, it dates back to prehistoric times. It is the city of carpets, velvets, glazed tiles, pottery and rosewater to visit the Royal Gardens of Fin, with its abundant water-supply, garden, pool with numerous spouts, and an old historical bathing-house, The Qajar period Agha Bozorg Mosque boasts a symmetrical design and minarets composed of exquisite tiles. A large door is decorated with studs that represent verses in the Quran and then Sialk Mounds a settlement belong to approximately 4,500 BC. – Any other items not mentioned above.